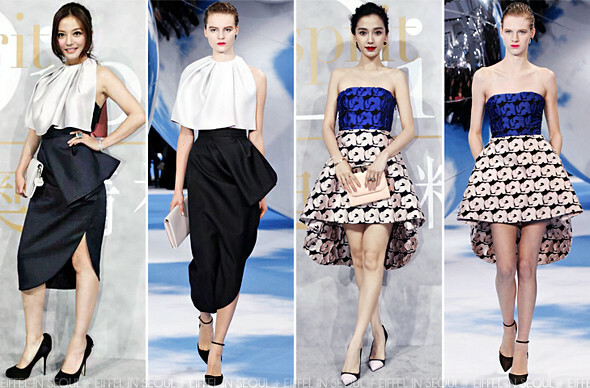 Christian Dior celebrated the opening of 'Esprit Dior' exhibition held at MoCA Shanghai in Shanghai, China on September 12, 2013. Chinese actress, Zhao Wei (赵薇) was my best-dressed at the event wearing a pale grey silk cape with a wool skirt from Christian Dior Fall/Winter 2013 collection. A white clutch and black pumps complete her look. Angelababy (楊穎) opted for a floral-printed strapless two-piece from Christian Dior Fall/Winter 2013 collection. A pale pink clutch and matching cap-toe pumps to accessorize her look. Chinese actress and Dior's ambassador, Ni Ni (倪妮) wore a white silk dress with a printed Andy Warhol shoe with butterflies. Black clutch and shoes to complete her look. Her smile was her best accessory. Shu Qi (舒淇) opted for a floral printed jacquard strapless dress from Christian Dior Pre Fall 2013 collection. Completing her look with a pair of white Dior pumps.